The Velodyne Optimum-10s 10 driver combines with 1200W of output power and a forward-firing design to deliver full, detailed bass from a compact subwoofer that can be easily placed in a cabinet or corner without sacrificing performance. The included setup microphone can be used in conjunction with the Optimum-10s room equalization technology to customize this subs performance to the acoustic properties of your listening area. Finally, the front-panel LED display and remote control make it easy to command your bass experience. 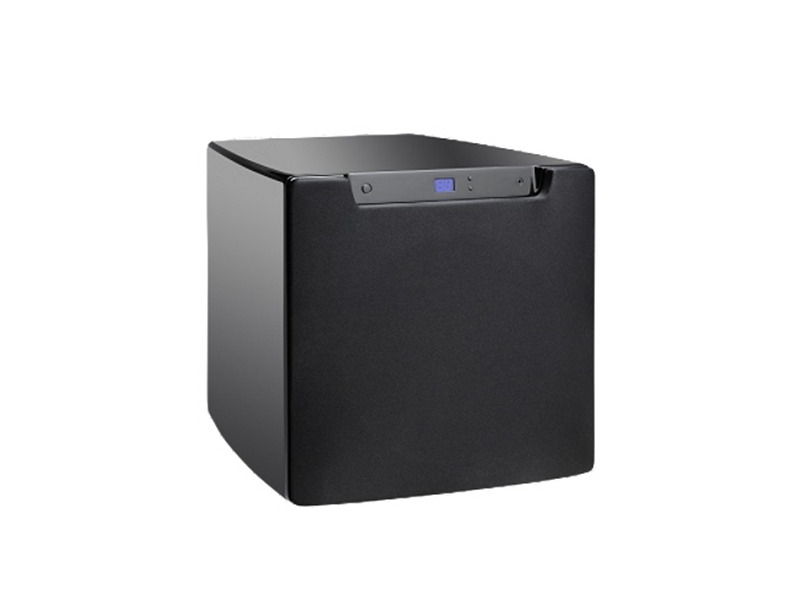 The Optimim 10 is a great performing Subwoofer . Featuring the same 3”!voice cool , 346 oz magnet rubber surrounds, treated woofer , 1200 watt Rms with dynamic peaks reaching 2400 Watts all the same as the Optimim 12 . Setup is very important. If your not using Velodyne’s calibration microphone follow the setup instructions . You can also use your receivers calibration and system. If you dint have one . I recommend using your receivers calibration setup with microphone. Its important to set the back of the Subwoofer to direct to allow the receiver to control the Subwoofer. A receiver with 32xt Audssey would be ideal . If you are fortunate enough to own the Velodyne’s Optimim line Subwoofer. Velodyne gives you full control from a remote and blue light display to guide you through setup from your favorite listening seat for music or movie . Just follow the prompts through phasing, eq settings , setting up hertz filters and other settings . Remember the remotes quick set eq for rock , movies , jazz etc etc can also improve the audio . I always then tweak my settings after calibration after watching a few movies and listening to music . I like a little more bass in everything. Once it’s dialed in . Welcome to a new world of listening pleasure . This is why the Optimim line is so sweet. If you just replaced one of those big box store subwoofers or another cheaply internet Subwoofer pushing little power and a weak driver and a cheap cabinet. Then You are going to notice some bass is gone form your favorite movies and music . No worries . That was distortion you were listening to. It’s not your fault , it’s because the Subwoofer you were using was not able or capable to distinguish different low fewency sounds correctly. This is where it gets good with your Velodyne Optimim 10 . Velodyne has taken its vast years of Subwoofer technology with today’s hi tech parts to build s qualities driver and matched it with a high efficiency 2400 watt amplifier low distortion amplifier with on board technology to empower you to achieve a audiophile low excursion experience. This is where in the beginning I told you about the Subwoofer driver and powerful amplifier. You are going to hear the difference in instruments , digtal enchance bass and special effects . None , for its size . It is just a breathe taking low fewency performance. My only real complaint is the finish . Structurely it is perfect . The finish easily scratche .I have subwoofers have a better durable finish . But Those subwoofers can’t touch the overall performance the Velodyne Optimim provides . Who wouldn't want to try velodyne if you are in the market for a subwoofer? It's the first name that crosses people's mind when researching for a subwoofer. So, I've bought this little 10 incher. In my opinion: this sub is a bit of a let down. Comes with such glowing reviews everywhere but In reality it doesn't sound any better than some of the cheaper polks. It has fair bit of power but nothing "spectacular" like online shills have proclaimed. I **** you not It doesn't sound any better than a $80 logitech subs. I had listend to it for days try to come up with any reason for not returning it, before I gave up. It is heavy and it's a giant hassel to return it. On the upside, It handled movies well but any junk dayton or DIY subs can handle movies. I find it hard believe velodyne's claim that this subwoofer can fill a 3000 sq ft space. It barely filled my small 900 sq.ft. room at 2/3 volumn. DSP is a total markettting gimmick as I found out the hardway. Unless of course You've been weened on trash car subwoofers. Another upside was that It integrated well with my exisiting paradigms which I really liked. Jesus, I've been trying to find a musical sub for 10 yrs now. I've tried/built 2 DIY subs, paradigm low end subs and this optimum 10 hoping throwing money at it will solve the problem. I've listend to Deftech, para, velo, martinlogan, B&W, infinity etc. They all sound boooooooooomy, and sloppy. Optimum 10 so far is the best one out of them all but still no cake.